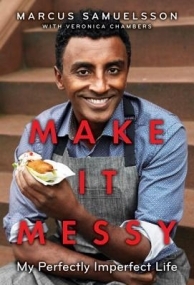 In this inspirational autobiography, world-famous chef Marcus Samuelsson tells his extraordinary story and encourages young people to embrace their mistakes and follow their dreams. Based on his highly praised adult memoir, Yes, Chef, this young adult edition includes an 8-page black-and-white family photo insert. Marcus Samuelsson’s life and his journey to the top of the food world have been anything but typical. Orphaned in Ethiopia, he was adopted by a loving couple in Sweden, where his new grandmother taught him to cook and inspired in him a lifelong passion for food. In time, that passion would lead him to train and cook in some of the finest, most demanding kitchens in Europe. Samuelsson, celebrity chef and owner of the Harlem, NYC restaurant Red Rooster, recounts his unusual path through life in this young readers' version of his adult memoir (Yes, Chef, 2012). Written with Veronica Chambers, who has done some great MG/YA books of her own, this is an interesting overview of an unusual life. After suffering from tuberculosis, which kills his mother, in Ethiopia, Marcus and his older sister are adopted by a Swedish couple who are already fostering a biracial girl. In 1970s Sweden, people of color were not common, and there were some racial issues. More importantly, though, Marcus played soccer with friends and cooked with his grandmother. After he realized that he was too small to become a professional soccer player, he started culinary vocational training, and worked his way into several very good restaurants, where the hours were long and the work crushing. He eventually contacted the owner of a Swedish restaurant in New York City, Aquavit, and was hired there. Life in NYC was very different, and he had a wonderful sense of no one looking at him in a way that didn't happen in the more homogeneous Sweden. He moved up the ranks, eventually becoming the head chef and then going on to a career in television that lead to him being invited to go to Ethiopia to reconnect with his cuisine of origin. Like Michaela Deprince's Taking Flight, this is an inspirational memoir that can be appreciated by many different readers. Samuelsson's early soccer career, as well as his apparent t.v. celebrity will appeal to some of them, and this book was a good length (212 pages) and engagingly written. Samuelsson mentions that one fascinating thing about traveling to Ethiopia was "seeing myself everywhere", and this cover, thankfully, does not hide Samuelsson's face! This will be an education in food preparation and different types of dishes for many students.